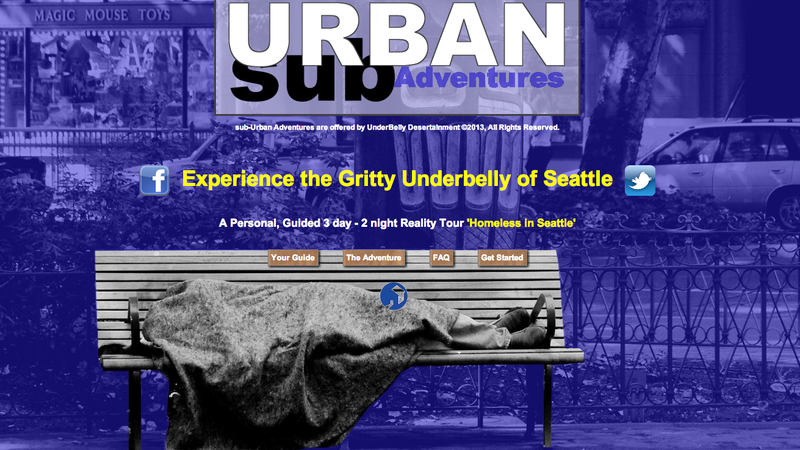 Homelessness is badass, according to this guided three day "sub-urban adventure" tour of the "gritty underbelly" of Seattle, which can be yours for $2,000. Howdy, my name is Mike. I am a 44 year resident of Seattle. As Seattle grew and became more expensive I wondered how homeless people survived as costs rose. I also began practicing a form of minimalism. I took 2 months in the summer of 2013 to find out for myself. I intermittently lived on the streets and learned about all the great resources provided by our city. I also met many interesting people and experienced a minimalist life style like none I'd ever experienced before. You Can Live on $600 a month in Seattle! I learned that homelessness is nothing to fear; albeit nothing to aspire to either. In 3 days I will give you a crash tour of the homeless life style. You will gain a new respect for the folks that are forced into this existence. You will see the seedy side of Seattle in a new light and have an experience that you will never forget. Embrace the Adventure! The first day we will start at the Public Market and visit some of its homeless gathering spots. We'll walk down to Pioneer Square, via the waterfront, and visit the favored spots along the way including the Compass Center; a major resource under the viaduct. We'll wander over to the International District via the Courthouse on 3rd and James. We'll have to check in at our shelter, in the International District, by 7pm so we'll pick up some fruits and vegetables on the way for dinner. Out of the shelter by 7am, we'll get some coffee and head up broadway to check out some parks and Tent City3, frequented by the homeless. You might have enough chutzpah to try your hand at panhandling or sleeping on a park bench on this leg. You'll get a real perspective on how the public perceives the homeless. We'll meander on down to the Recovery Cafe where we'll get a nice free lunch and espresso. Here you'll have a chance to sit and converse with fellow homeless folks. It's very nice. It was funded by the Gates Foundation. Then it's off to the beautiful Seattle Public Library. Many homeless people spend their days here. We'll have a first class dinner at Fare Start, where homeless folks are trained by world class chefs. Tonight we'll stay at the historic Moore Hotel. We stayed at the Moore Hotel so that we could get out and wander the wiley streets at 3am. We'll sleep in a bit and then have a nice breakfast at the Moore Coffee Shop before meandering up through Belltown checking out more homeless haunts along the way as we head towards Queene Anne and the Seattle Center; a favorite hangout for the homeless. After a pleasant afternoon at the Seattle Center we'll test the dress codes at some of the finer restaurants on Queen Anne and then top it off with a cocktail and conversation at a long time watering hole, a historic working class dive bar the Mecca Cafe. Will I be safe? - Absolutely. We will be GPS trackable online and 911 will be one click away. It's also not near as dangerous as you might perceive. I will teach you some homeless etiquette that will go a long way towards gaining respect and facilitating interesting conversations in our encounters.